As I mentioned earlier (see: https://bushsnobinafrica.wordpress.com/2015/06/19/drones-in-the-bush/), we did get an improved drone as soon as prices dropped. Although my son immediately managed to fly it, I am still building my confidence after the earlier mishaps! However, as this contraption almost flies by itself, I believe that with a bit of practice I will soon manage. I will report on “droning” in a future post. In addition to the drone, I have improved on my camera and bought a Nikon Coolpix P600 with a 60X optical zoom. I chose this (in fact my daughter did…) because it is powerful while being quite light. We are already loaded with binoculars to add more weight! Not being a pro, it is good enough to capture what I see although I have always believed that there is no substitute for your eyes! To this I added a tripod and downloaded an App that enables you to take pictures wirelessly using my smartphone. Going almost beyond my mental capability I also got a camera trap! Its increasing use worldwide has made these affordable so I decided to get one as well to top up my gadget bag that already contains a number of goodies such as UV torch, normal torches, battery boosters for phones, video camera, night vision googles and binoculars. They both have been a great success so far. 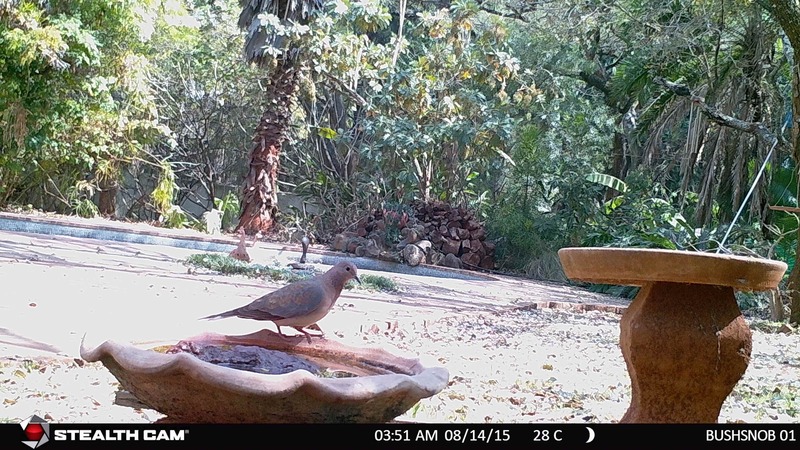 The very day I got the camera trap -brought from the USA by my son- I set it up in the garden and I have done so for a few nights over the last couple of weeks. 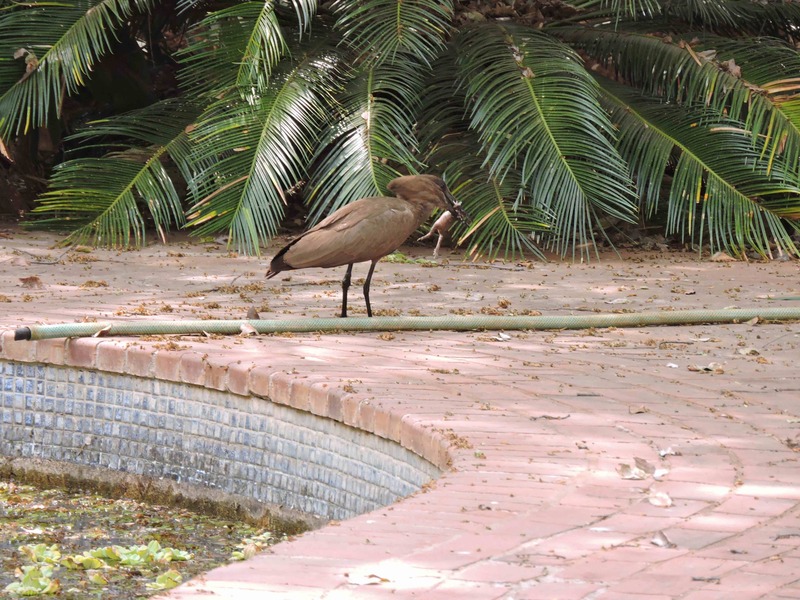 Although It is not meant to take high resolution images, its pictures are good enough to identify animals, provided that you point it in the right direction! 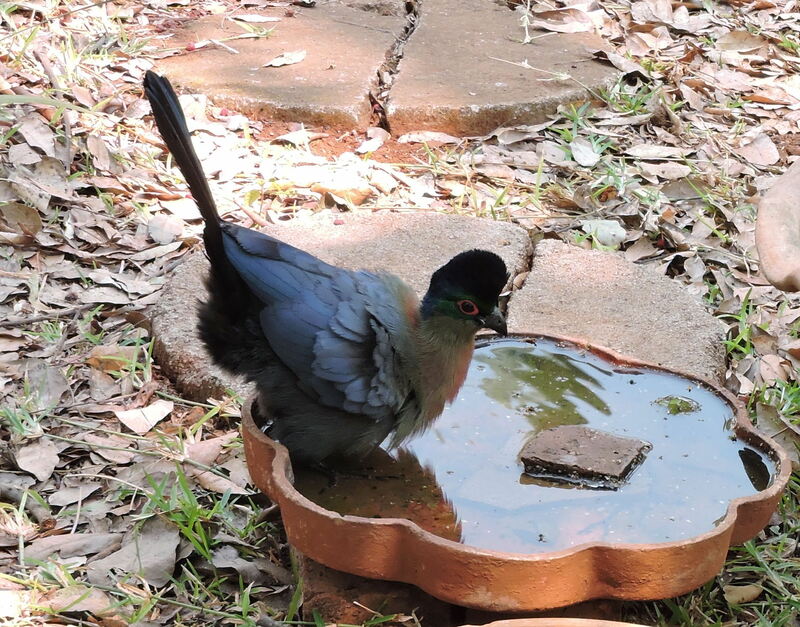 Through the pictures and videos it took during the day I managed to confirm some of the birds visiting our bird bath and feeding table as well as to detect some new ones. So far we had mourning dove, forked-tailed drongo, dark-capped bulbul, kurrichane thrush, white-browed robin chat, yet unidentified weavers and fire finches, blue waxbill, variable sunbird and purple crested lourie. 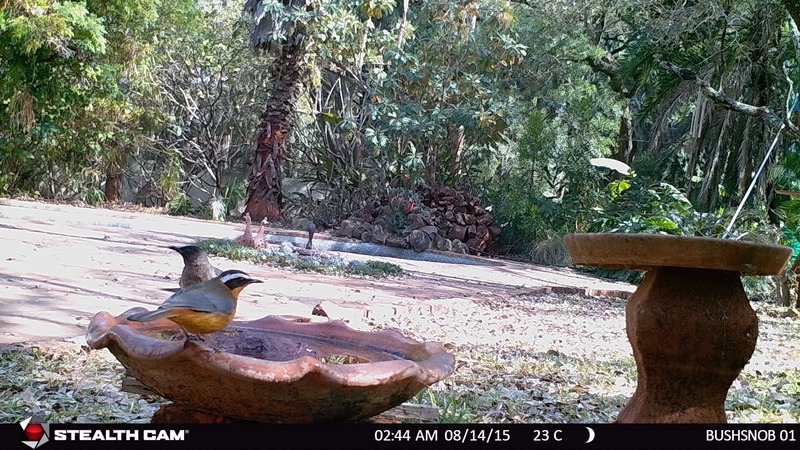 In addition, leaving the camera overnight confirmed the crepuscular habits of both robin chats and drongos. A robin chat and bulbul. A pair of variable sunbirds. 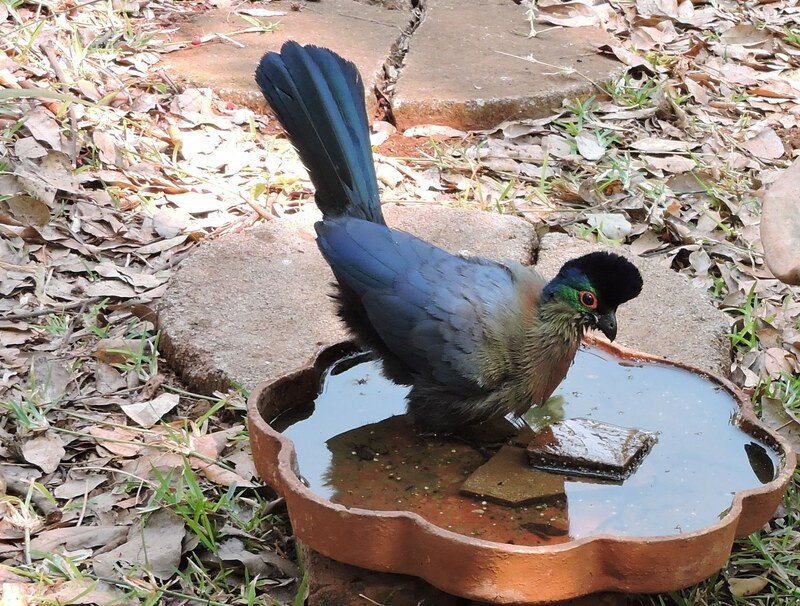 A close-up of a purple-crested lourie. I also did some detective work in connection with the unravelling of a garden mystery: the nocturnal disappearance of the bird seed from the feeding table! I managed to expose the culprits that were no others than the suspected African Giant Pouched Rats (Cricetomys sp. Ansorgei). They were already high on the possible culprit list as we had evidence of their presence through large fresh burrows and macadamia nut shells found in the adjacent areas. If you have tried to crack one of these nuts, it will give you an idea of the gnawing power of these animals! 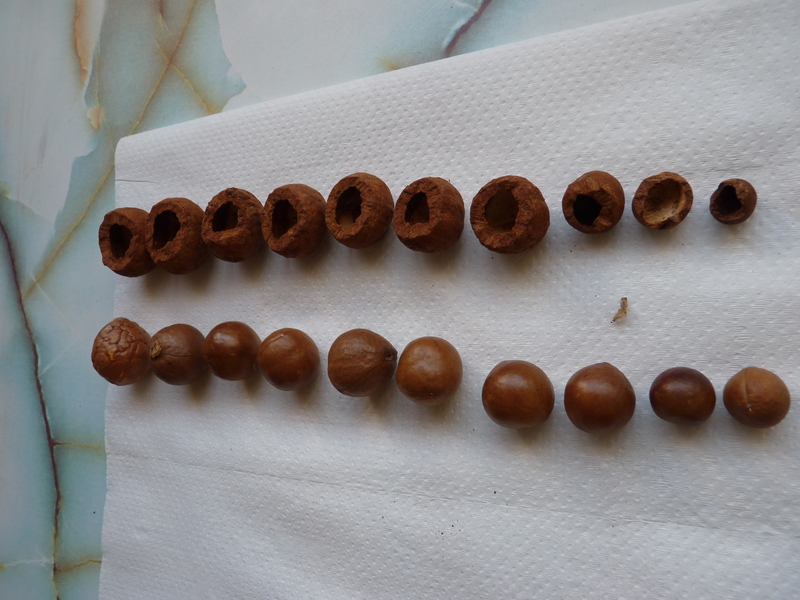 Macadamia nut husks (top) and whole nuts (bottom) to show the way the rats eat them. In addition to finding the somehow expected rats, we came across another animal that came as a surprise as Nature will not disappoint you if you look for new things! One of the nights we were after the bird seed-eating culprits an African civet (Civettictis civetta) came by for a drink! Consulting the Internet I learnt that they do move into urban environment and that they also climb on house roofs! 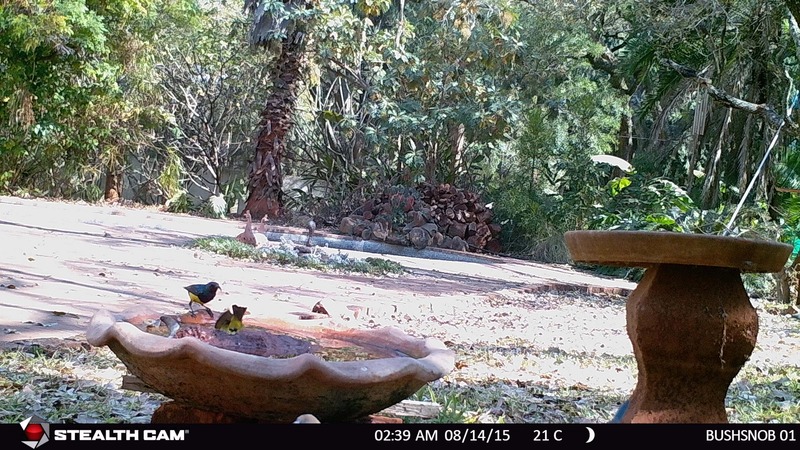 Having detected the birds and animals present in the garden, it was time to use the tripod and remote control on the Nikon camera and attempt to document some of the visitors with a better resolution. This I am doing at the moment and learning. 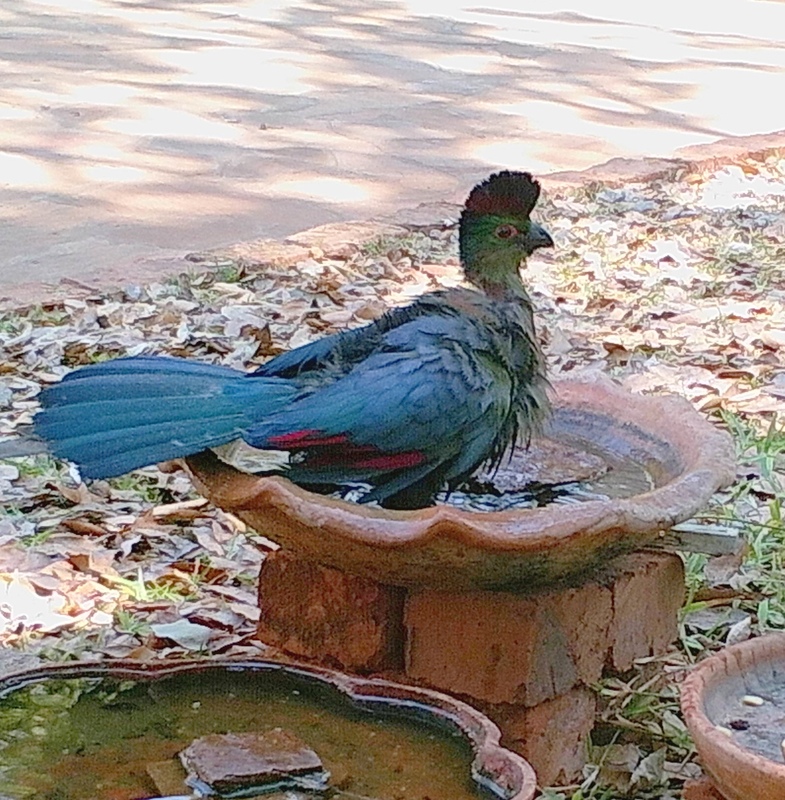 Better pictures of the lourie bathing taken with the Nikon camera and remote control device. The louries have always been in the garden but always high on the trees. 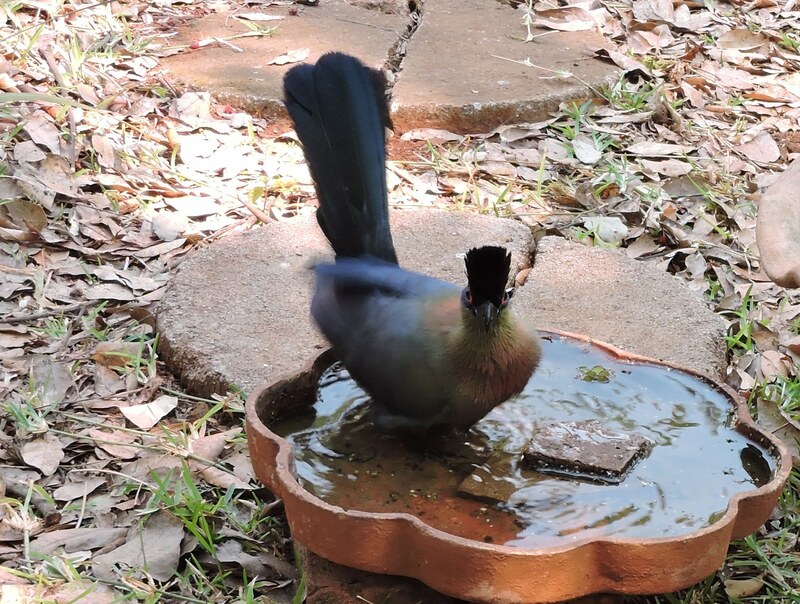 It is only recently that they have decided to come for a dip in the birdbath. 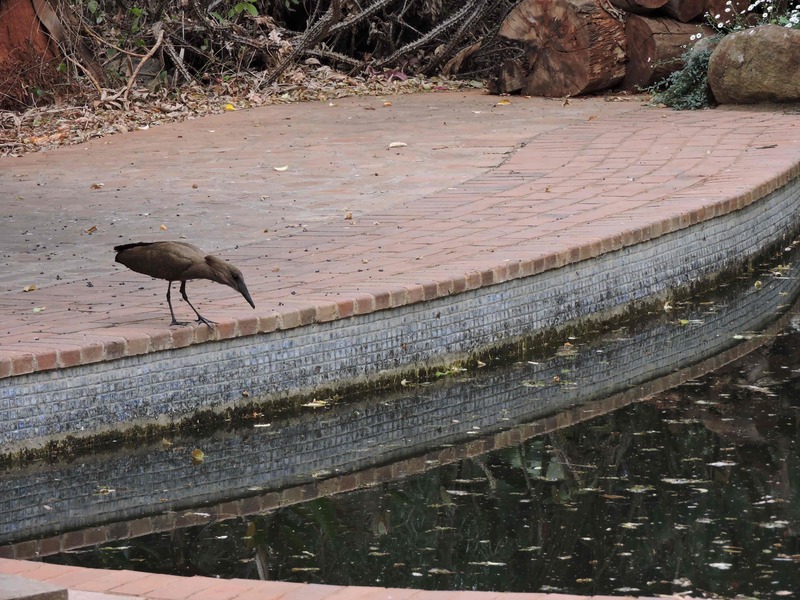 The hamerkop comes often to decimate the toad population in our water storage tank (read swimming pool). 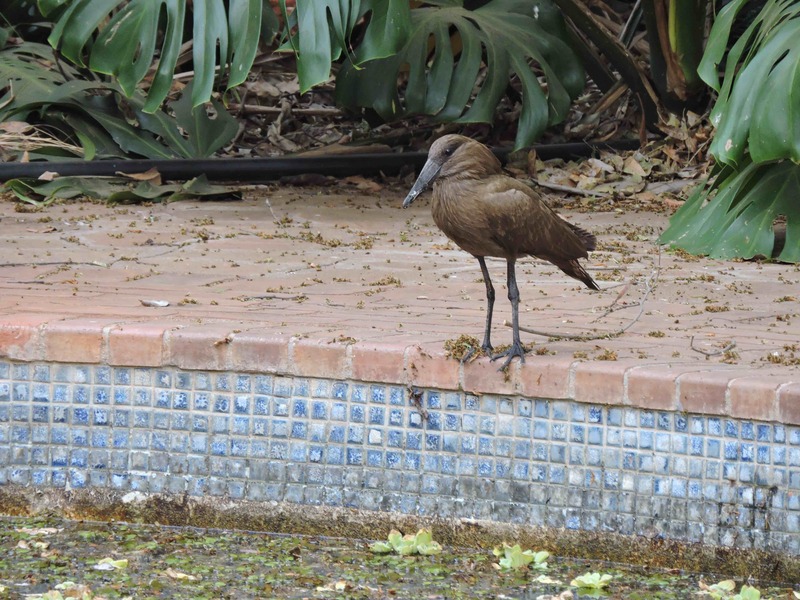 The hamerkop taking up position by the pool. I need to take advantage of the present dry conditions prevalent in Harare so when the rains come later in the year the animals will disperse. Note: this post has not been checked by my Editor. 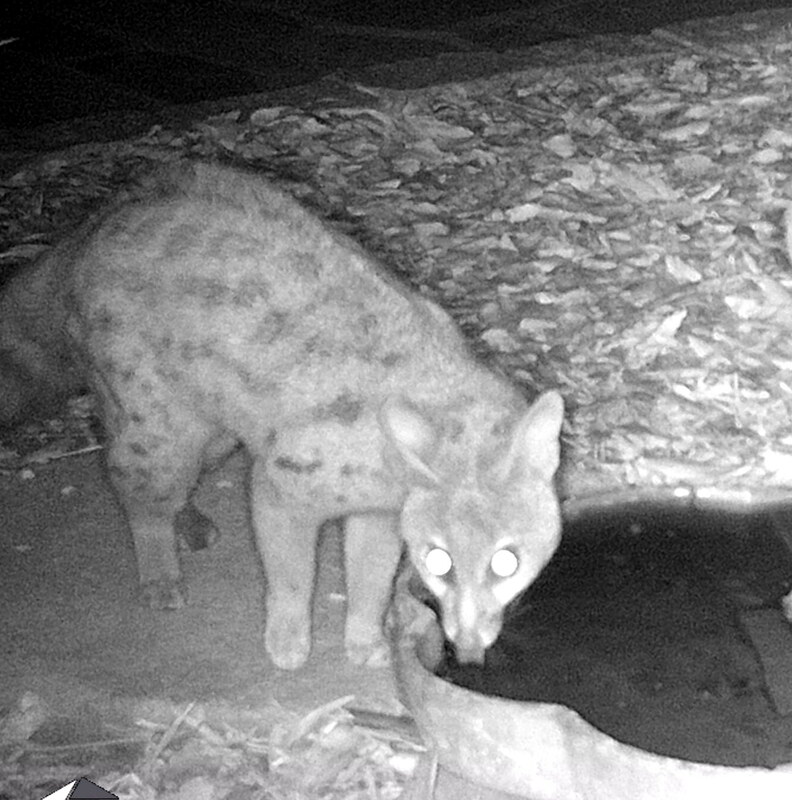 Added on 5 September 2015: Although I identified the night cat-like visitor as an African civet, subsequent Internet search makes me think that it could in fact have been a genet. I am trying to get another picture to clarify the situation.